Musab Younis argues that our perception of the "battle for the internet" is skewed by our acceptance of a hierarchical network run in the interests of advertisers, whose ability to codify, individuate and manipulate large populations is being increased by the spread of social media. When the feelings seize upon exchange value it is no mystical transubstantiation. It corresponds to the behaviour of the prisoner who loves his cell because he has been left nothing else to love. The presenter of a recent documentary set up a stall in a London outdoor market and invited people to fill out a questionnaire on his laptop which, when completed, would inform them of their monetary value to internet advertisers, based on factors such as their income and how much they usually spend on clothes. The aim of the experiment was to suggest that people might benefit by selling themselves to advertisers directly. People were discussed in terms of their “online presence” which, we were told, has direct monetary value. If only you were enterprising enough, the presenter hinted, if only you understood how public relations might be broken up and individuated, you would already be selling your online presence to advertisers. These advertisers would be using your online presence to sell you products. And in this curious symbiosis it is you, the individual, who wins. This has been a year during which many internet values, accepted as commonplace, were apparently challenged: internet freedom, uncensored social media, lack of government intervention. As SOPA threatened to drastically limit internet freedom and a major file-hosting website, Megaupload, was shut down by the US Justice Department, we witnessed much discussion on the ‘battle for the internet’. This was usually defined as the conflict currently taking place (and about to intensify) between the mass of people who freely use the internet and the smaller number of people who want to restrict its use in certain ways. Many had seen the battle coming. 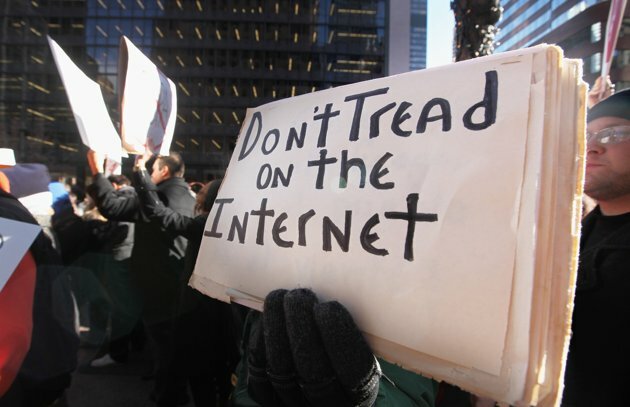 Last year, the Financial Times warned: “A key theme of 2012 will be freedom and control on the internet”. Back in 2010, for the op-ed writers of the New York Times: “The battle of ideas has started between the advocates of a universal and open Internet — based on freedom of expression, tolerance and respect for privacy — against those who want to transform the Internet into a multitude of closed-off spaces that serve the purposes of repressive regimes, propaganda and fanaticism.” There was widespread disappointment when Twitter in late January announced plans to block certain tweets in certain countries, bringing the principle of censorship, long trumpeted as antithetical to Twitter, to the heart of the platform. Here is a simple fact that is almost never directly stated: were it possible for Facebook, Google and Twitter to show only advertising and nothing else while maintaining their audiences, that is precisely what they would do. Advertising is not a side-project, a minor annoyance, an excrescence, an intrusive addition: it is the fundamental basis upon which the main internet companies make their decisions; it is the reason they exist. [p]ioneers of cyberspace can create new spaces for their own (very social) purposes (pleasure, politics, etc.) as part of a process of self-valorisation that at least initially threatens or transcends existing norms of capitalist society. Corporate capital then tries either to enclose their spaces by commercialising them if they look profitable, or to crush them if they look dangerous. The question ‘why should we care?’, delineated, gives us some interesting lines of inquiry. Most obviously, it comes out of a language in which the concept of the profit motive is so taken for granted that a system that runs without it is unthinkable and, even if imaginable, probably undesirable. There’s also the idea that a kind of stasis is possible: they use us, we use them, everything stays roughly the same. But while it’s true that the internet can be used for many purposes other than consumption, two further points must be attached to this truism: this has long been an aberration, and much attention is being devoted to it. That these peculiarities have continued for so long has led to the incorrect assumption that they will cystallise (for example, that ad-blocking software will be permitted to continue operating indefinitely.) In fact, momentous changes can be made to the governing structure of the internet because, at the most basic level, it has never been in public control. The three major twentieth-century developments that Alex Carey discussed in his history of propaganda — “the growth of democracy, the growth of corporate power, and the growth of corporate propaganda as a means of protecting corporate power against democracy” — remain in retrospect vital: only the terrain has shifted. Social media will have fulfilled its function not when it is impossible to differentiate between a friend’s message and a corporate-sponsored message, but when you no longer care which is which. This is precisely what the major companies are working towards; and as the platforms develop, the attempts at disguise become less earnest. Twitter has already implemented a plan to profit from its users by encouraging companies to purchase “promoted tweets”. The reaction expressed amongst users to this new policy – encouraging one another to block promoted tweets, or to report them as spam — results from an unwillingness to engage with what Twitter is: a company that has value to its owners only in the sense that it can generate an ever-increasing supply of money from its users. The annoyance and mild exasperation which social media users express when first confronted with advertising before resignedly accepting its presence relies on the illusion of power people feel when they are voluntarily using a service that they can technically leave at any time. And the nature of social media encourages us to think that it is within our control, despite mild interventions from mysterious technocrats above who are extirpating bugs and improving layout. But to state another uncontroversial truism: the social media user has practically no power. Successive Facebook changes have been rolled out with barely a pretence at consultation; the same is taking place with Twitter. The power you have to leave Facebook or Twitter is the same power those before you had to ignore television, the radio, and newspapers when these became overrun with advertising and profit. There has not been in recent history mass resistance to take-up of a genuinely useful and affordable technological innovation because of disagreement with the ownership structures of such technologies. Once a technological platform can establish itself in society as a vital cultural force it acquires the aura of transcendental power, just in the sense that nobody now thinks they have a right to contribute to the output of Sky News, ITV or The Times. Responses to social media advertising are striking in their willingness to accept an orientation around profit, and their muted acquiescence to being broken down, tracked, manipulated, and sold to advertisers. A typical response to Twitter’s new promoted tweets policy runs as follows: “The idea of targeting is that it works better for everybody: the advertiser gets a better audience, people get the service they want — and perhaps ads that are actually useful, and the service provider gets to make a little money too. Right now, that balance is tipped in the wrong direction …” The toy-town cute image: of the friendly advertiser who wants a “better audience”, letting the service provider “make a little money” by giving the people “useful” ads, is reminiscent of nothing so much as 1950s anti-union corporate propaganda in the US. The false symbiosis, the vacuous conception of harmony — between corporations themselves, and between corporations and the public — is a propaganda trope that has never had any basis in reality. It works because the advertising and brand awareness itself domesticises monolithic and hierarchical corporate entities, giving them logos, mascots, cute slogans like “don’t be evil” and awards as best employers, at precisely the same time as it prevents any serious discussions arising about power, participation, wage labour and work. Meanwhile, the emergence of the internet meme has not been entirely spontaneous and cannot be said to represent, despite some claims, a new form of hyper-democratic sharing or an irreverent take on power or celebrity. The recent prevalence of the widely-shared image, especially on Facebook and Tumblr, is the manifestation of conscious decisions that have been taken to reduce text-based sharing (especially in its long-form variants) and to encourage an online experience that involves the rapid absorption of easily digestible images. In its low-fi nature, its pixellatedness, its brashness, this is a curious development. One might have assumed that as technology developed social media experiences would become more complex. But while the technology of pure consumption online has increased — primarily in the form of streaming high-quality video — the technology of social media has exhibited regressive aspects. 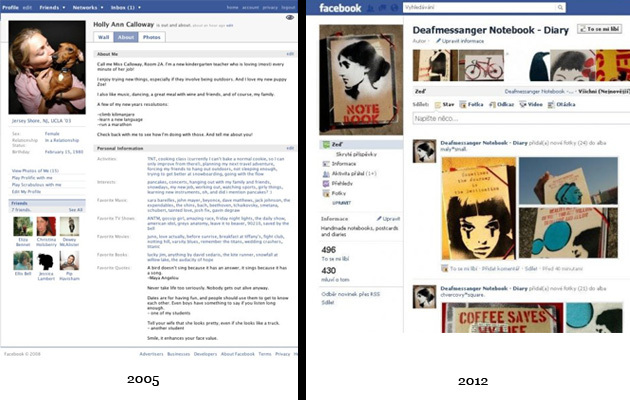 Facebook has moved slowly from being a largely written medium and relatively free social space to a user feed dominated by images: it is striking to see just how far its text content has been systematically reduced. At the same time, and without effective protest, opportunities for horizontal social interaction have been successively and effectively limited: the move from Groups to Pages, the growth of Apps, the physical narrowing of the page. This latter development has formed the most obvious move toward the wrenching apart of the social media website to accommodate more advertising. The meme – with all its cultural tropes, celebrity, humour, self-referentiality — provides the next stage in what has been called, drawing on Benjamin and Berger, the work of art in the age of digital reproduction: “For the first time ever, images of art have become ephemeral, ubiquitous, insubstantial, available, valueless, free”; one needs only to add a perversion of the aesthetic sensibility of Sontag’s “Camp” and the office of an advertising executive to veer uncomfortably close to it. To recall A. Sivanandan’s point that civil society is “no pure terrain of consent where hegemonies can play at will; it is ringed around, if not with coercion, with intimations of coercion”, and to remember that the civil society of the internet is no different, even if these intimations of coercion often appear to ebb, is to see — at the most basic level — online developments bearing a relationship to power in the real world and not simply taking place in a vacuum of networked individuals. Some examples represent what we might think of as the “hard” edge of power exercised online: the research that is ongoing into the ways in which counter-insurgency” power can be generated and sustained online, including in social media, for example. The spread of “tethered appliances” like iPhones that retain umbilical links to their corporate headquarters and cannot be easily modified by their users has been discussed, notably by Jonathan Zittrain; such appliances are gaining dominance and with them a restricted and controlled internet experience. Moving towards the “softer” exercise of the same power, we might observe that the image is becoming to the internet what the printed advertisement became to the newspaper. Recall that at each stage of advertising the previous stage looks absurd, obsolete, unconvincing: a constant renewal is required. Advertisements from twenty years ago are now merely funny, having been stripped of any persuasive appeal, and in the process wrongly telling us that they never had this appeal in the first place. Adorno’s dictum that “[t]he star principle has become totalitarian” continues to demonstrate its relevance with the move towards platforms which privilege major figures and hierarchy over organic networked groups. Twitter can bring celebrity back into social media in a way that Facebook could not, though it tried with the ‘Page’ system. We might see social media as undergoing a controlled though complex evolution, away from a non-hierarchical connection of individuals with others around their social circles and spheres of interest, to a platform that reaps the benefits of building illusory links with mythical blue-ticked figures. It would be inaccurate to give the impression that this system forms an unassailable totality without any agency or capacity for resistance on behalf of its users. The caveats are numerous and well known, with sites like Wikipedia so far existing to some degree outside the corporate internet system. But too much has already been said about little attempts at resistance such as the much-vaunted denial-of-service attacks on government websites, and much of that discussion has unfortunately obscured the picture. There is no equivalence in power between the hacker and the government; the first to understand this are those hackers who have become familiar with prison cells. Resistance can be properly understood only when the distinction between the keyboard and the truncheon is accepted and considered. « Previous: Science | Beyond the Higgs Boson: can future choices really affect the past? Fantastic piece. I came across ‘Google Fiber’ the other day – a project by a huge corporation to petition states to help install (no doubt subsidise) massive fibre-optic networks in the US – all piped through with the massive Google logo of ‘data liberation’ on it. Good article, but I think the battle for the Internet is not something new, and in fact has been going on for at least ten years since the idea of net neutrality came into the debate – or, more accurately, the prospect of departing from a net neutral version of the Internet became possible (and such a departure would be not necessarily in the interests of users, but in the interests of Internet Service Providers et al trying to increase their revenues without necessarily improving the quality of the service they provide). The history of the Internet itself is a kind of tension between the open, sharing current and the privatising, commercialising current, and it’s hard to say that one without the other represents the ‘true’ nature of the network.